click this link now click here now JOIN OUR NEWSLETTER // Sign up today for our monthly Nevada newsletter. A wet winter providing plenty of fuel, hot gusty winds, and dry conditions…. all resulting in an extreme Nevada wildfire. the impact on Nevada wildlife could be felt for years. As predicted, the record precipitation occurring over the past winter has created a significant fuel load across much of Nevada this season, with wildfires occurring throughout the state. 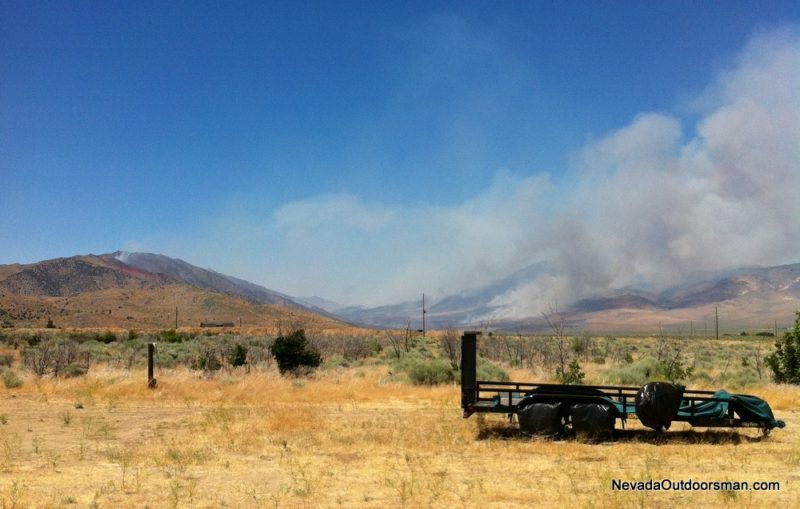 As of July 14th, over 281,000 acres had burned from Northern to Southern Nevada, impacting current wildlife movement of bighorn sheep, mule deer and elk. As significant, the fires have devastated crucial wildlife habitat which will have an impact on all wildlife both currently and in the future. Currently, do your research on your upcoming hunt unit by accessing past and current fire conditions for the area. Anticipate the game will be up and moving according to the fire patterns. If you’re scouting, notice patterns of past fire activity near your unit; surprisingly you may find areas within the units which are untouched by fire. This is a positive, however if the fires came close enough the game may have moved up and out of even the most pristine habitat that is left. Before you leave for the hunt, access real time weather/fire conditions. The NOU website dropdown tab for “Climate/Conditions” can give you a wide variety of real time fire and weather information to stay aware of both prior to and during the hunt. In the future, get ready to volunteer. Various state agencies plan on re-seeding large areas of decimated wildlife habitat, for example, areas of the 30,000 acre Long Valley fire that has just been contained in Northern Nevada. Volunteers will likely be needed to help re-seed and re-establish that habitat for wildlife; Nevada hunters and anglers will likely be needed in large to assist in this effort. As always, be fire safe when you head out. Carry a shovel, water, and make sure all your equipment/vehicles do not unintentionally contribute to the risk of more fire danger. The future of Nevada wildlife depends on you!